In general, hamartoma frequently occurs in the lung, heart, or hypothalamus, and its occurrence in the gastrointestinal tract is very rare. 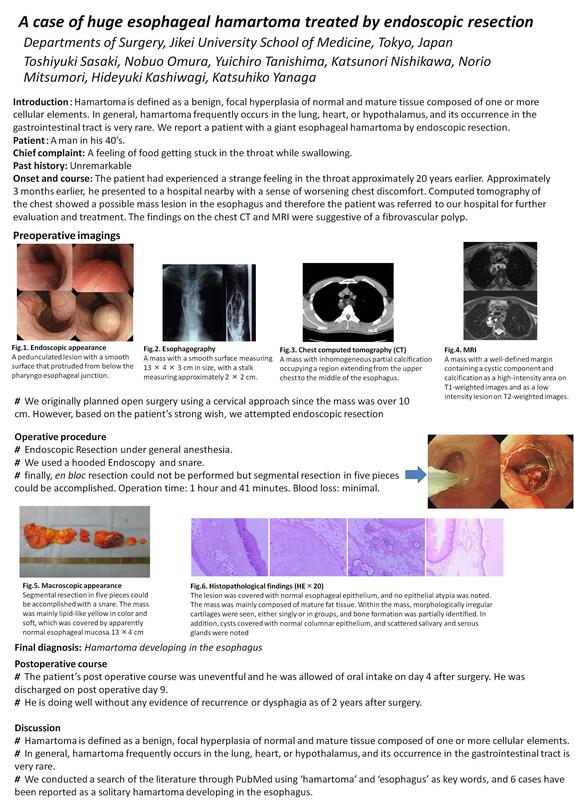 We report a patient who underwent excision of a giant esophageal hamartoma by endoscopic resection under general anesthesia and review the relevant literature. The patient was a man in his 40’s with dysphagia. Upper gastrointestinal endoscopy demonstrated a giant pedunculated polyp that protruded from the esophageal entrance. Esophagography revealed a mass with a smooth surface measuring 13 × 4 × 3 cm in size, with a stalk measuring approximately 2 × 2 cm. Taken together with the chest CT and MRI findings, a tentative diagnosis of fibrovascular polyp was entertained. The tumor was successfully excised by endoscopic resection with a snare under general anesthesia. The final pathological diagnosis was hamartoma of the esophagus. The patient had an uneventful postoperative course and was discharged in good general condition 9 days after resection. He remains asymptomatic without recurrence as of 2 years after endoscopic resection.